The second came today and, whilst nowhere near as important as Kubica’s well being, still provided some cheer here at Badger. It came from Renault boss Eric Boullier, who stated that Nick Heidfeld is among those being considered to fill in for Robert. As we see it, Nick is the only man available capable of keeping Kubica’s seat warm whilst also helping Renault progress from last year’s strong display. The other men in the frame are Force India refugee Tonio Liuzzi and Renault reserve driver Bruno Senna. The former should be ruled out following what was an inconsistent 2010 season in which he failed to match the performances of Adrian Sutil. As for Senna, whilst we have every respect for the lad (he was impressive in F3 and GP2) his single, troubled year at Hispania doesn’t qualify him for this job. His only point of reference is the un-developed Dallara that the Spanish team ran in 2010, and whilst he wasn’t by any means embarrassing he did find himself beaten by Christian Klien on two of the three occasions that the Austrian was his team-mate. Hardly the stuff of champions. And even if he had shown well Senna lacks the experience the team so desperately needs to move forward. With the inexperienced and inconsistent Vitaly Petrov in the other seat a driver with plenty GPs on his C.V is the order of the day. Nick fits that bill, having started a whopping 172 F1 races. 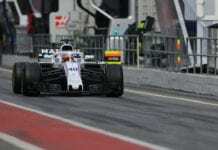 He’s a skilled development driver who would be unfazed by racing for a big team (after all, he competed for Williams in 2005 and for BMW between 2006 and 2009) and would take no time at all to get up to speed. He proved that when he jumped in a Sauber for the final few races of last year, quickly getting on Kamui Kobayashi’s pace and scoring six points in the five races he contested. Nick has already had contact with the team, having sought Petrov’s seat whilst the Russian’s position remained unclear over the winter. That he didn’t get it is a shame in itself, but that’s not what we’re here to talk about now. From what we’re hearing, and briefly saw in testing, the new Renault is a bit special, capable of fighting for wins this year, and it will take a proven driver – the type Kubica provided them with – to make that count. Whilst it would be nice to give a youngster a shot that can’t be the team’s focus – their focus must be on the driver who will be most competitive in the shortest amount of time. In the clear light of day the choice between a near-rookie and a bloke who’s closing in on 200 grand prix, with 12 podiums and 225 points to his name, should be pretty open and shut. It’s a horrible situation for Nick to be in – as former team-mates he and Robert (or ‘Wobert,’ as he so endearingly called him) were friends, and the German wished him well via his website on Sunday. He won’t want to get the chance this way but unfortunately this is racing. We hope that, whilst Kubica makes as speedy a recovery as possible, Heidfeld is the man selected to fill his boots. That’s no easy task, but Heidfeld is the best placed to do it. Next articleWill pretty looking mean pretty quick?